Confinement refers to the distinctive lifestyle that a mother adopts for a set period following child birth. This lifestyle focuses on physical rest, and a modified diet to aid recovery. Traditionally, the mother stays exclusively inside her home during the confinement period (hence the 'confinement' reference). Most cultural groups consider the confinement period to last for one month, though some cultures observe this for up to 90 days. In Chinese, this period is known as 坐月(zuo yue) or 坐月子 (zuo yue zi), literally translating to 'sitting-month'. You will also see 'doing the month' as another alternate translation. In many social circles, confinement is known for the strange traditions and restrictions (or taboos) that certain people follow during the confinement period. We believe confinement was originally practiced to help a mother recover from the physiological impacts of pregnancy and delivery, and to protect her health in this vulnerable period. 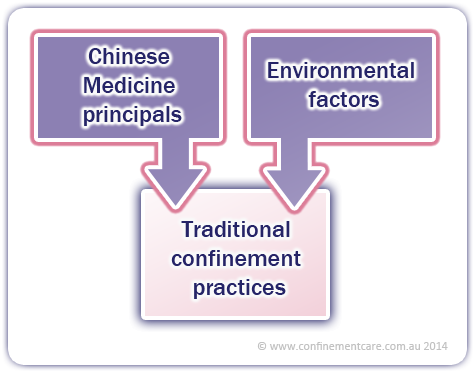 It appears many confinement practices were founded on fundamental Chinese Medicine principles and applied to the limitations of their environment (such as unheated homes and the presence of waterborne diseases). During confinement, close family members assisted with cooking and daily chores to give the mother opportunities to rest. The mother's diet was modified to aid in her recovery, and she would be protected from activities and environments known to cause illnesses. In short, confinement focused on the mother's recovery following child birth, presumably to boost her health as she becomes the new-born's carer. In recent generations, confinement has lost much of its original intention in many cultural groups. Many confinement practices have turned into tradition-based rituals used to define a person's identity, even though they may not benefit the mother and the infant. To many, practicing confinement means blindly keeping to a defined set of restrictions relating to cleaning, movements and diet. Sadly, it is also common to see young mothers 'enduring' confinement purely out of fear of not doing so. Misunderstanding about the purpose of confinement, and the spread of various superstitious traditions further complicate the issue, and is putting modern mothers into uncomfortable positions when it comes to practicing confinement. Is there a place for confinement in the modern era? Yes, confinement will benefit the mother and the infant when its primary aim is to restore the mother's health (which in turn, also increases the well being of the new born). 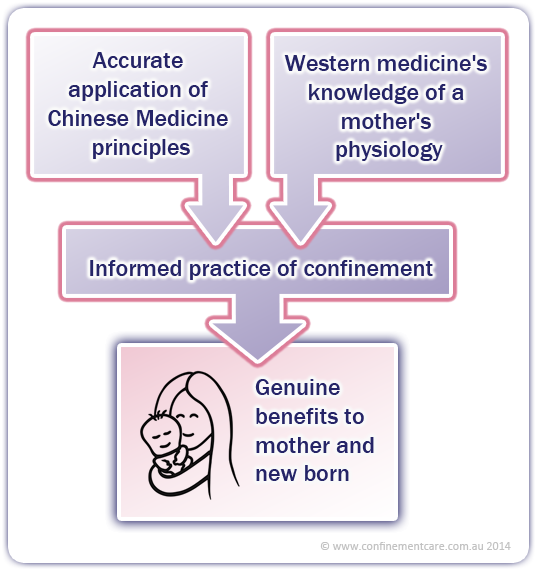 This takes place when confinement is based on well founded Chinese Medicine principals from trained and qualified practitioners, combined with knowledge of the mother's physiology from a Western Medicine's perspective. The basis of confinement should focus on the presence of quality rest, appropriate exercises, emotional and practical support, a considered diet, good personal hygiene, and the correct use of Chinese Herbal Medicine and acupuncture to aid the mother's recovery. Visit the [How Do I Practice Confinement] page to learn about how to practice confinement for the benefit of the mother and the baby. In recent years, confinement is being redefined in many metropolitan cities of Asia, and rituals are gradually replaced with medically-informed practices. Due to changing geographies, it is also becoming popular for mothers to engage paid full-time or part-time carers, rather than getting help from family members. In Chinese, these carers are called 陪月 Pui Yuet, which literally translates to 'companion for the confinement month'. Other terms such as 'confinement ladies' or 'confinement nannies' are also used. The carers' roles typically include, but are not limited to, preparing and cooking confinement meals, cleaning the home, looking after the new born when the mother is resting, and providing general confinement advice. Many of these carers have some training in confinement care and most have extensive experiences in raising their own children, or from previous confinement engagements. 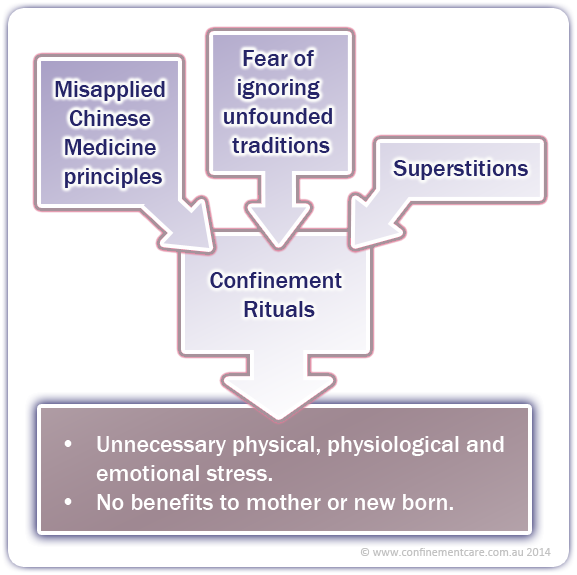 Confinement carers are not extensively trained in Chinese Medicine, but will typically refer to their experience, or to some published sources for information. Confinement retreats have also been developed in some Asian countries (particularly common in Taiwan) where mothers can move into these centres upon discharge from hospital, and enjoy a month of comprehensive care from a range of health professionals. In Australia, most mothers practice confinement without the help of a paid confinement carer. This can be more difficult, but is possible because we are blessed with a clean and comfortable environment in Australia. Some husbands can take leave or work shorter hours so they can spend more time at home. We also have modern technologies and bigger kitchens that make everyday tasks such as cooking and cleaning easier. Having supportive friends and family nearby will help too. If you live in a capital city, you will also have access to trained and qualified Chinese Medicine practitioners who can provide Chinese Herbal Medicine and acupuncture support, together with Chinese dietary advice. How can I practice Confinement? Visit our DIY Confinement pages for practical advice on how you can benefit from confinement knowledge and practices. Go to the [How Do I Practice Confinement] page. If you live in Sydney, our accredited Chinese Medicine practitioner at Confinement Care can provide a range of Chinese Medicine support for your confinement. This includes Chinese medicine consultations, Chinese Herbal Medicine and acupuncture treatments provided at the convenience of your home. Our in-home consultations will also give you opportunities to clarify any additional queries you have over specific confinement practices.